A bunch of bananas in the making. WE RETURNED from a week in Mexico City last Sunday to discover that we had left home in winter and returned in springtime, weather-wise, at least. We’ve passed thorough 14 winters at the Hacienda and only twice, perhaps thrice, have we enjoyed a winter without one overnight freeze. The 2016-17 season is the latest. Alas, spring here is no circus, the worst of the seasons. The only positive aspect is that there are no overnight freezes. Instead there is dust and drab, brown mountains. What passes for heat in these parts happens in springtime. The fact of the matter is that spring is pretty yucky. Our capital visit was very profitable. After years of waiting, we picked up the deed to the condo. We hired a guy to lay a nice ceramic floor on the service patio. He also improved the drain system for the clothes washer. We found a great new restaurant nearby. Fact is the entire area is going upscale rapidly. When I first set foot there 15 years ago, it was ugly and industrial, which is why the colonia* is called Nueva Industrial Vallejo. My arrival, it seems, on most any scene delivers a certain panache. It happened here where we live on the hardscrabble outskirts of our mountaintop town, and it’s also happened in Nueva Industrial Vallejo. We fled to San Miguel de Allende to escape Carnival. We went to Mexico City for practical matters. But now it’s time to get down to business. Springtime is for renovations. Our favorite contractor comes today to provide prices for work here at the Hacienda and also at the Downtown Casita. Due to the stupendous dollar-peso exchange rate over the last couple of years, we’ve done lots of improvements we likely would not have done otherwise. And that’s where stuff stands at the moment. * Sort of like a big neighborhood. Regarding the devalued currency of the realm, we had that advantage in Canada from about 1998 until several years after when the Canadian dollar found its footing. But upon repatriation of our sale revenue from our place in Canada, we are taking a hit from USD:CDN. Oh, well, it was good while it lasted. We left a pretty sweet place which someone snapped up for cash (Canadians) and may they have the pleasure of owning as we did. USD:CDN was at par a few years back. Carole: Alas for us, but hooray for Mexico, the exchange rate is inching against us of late. Wonder how far it will go. “Us” being those who rely on dollars shipped electronically from above the Rio Bravo. So nice to read a positive post! You generally are positive, but there just seems to be so much negativity being exchanged. I can’t seem to have that cluttering up my mind anymore so “off with them!” Enjoy your updates on your life here and have hope of maybe meeting you and La Señora someday in the Pátzcuaro Plaza. Peggy: Thanks for the kind words. And, like you, I prefer a positive outlook to just about everything. Welcome back to the enlivening drudgery of home ownership. Today is my day to get back into the swing. It looks as if I am going to need the services of a good painter soon. Señor Cotton: I don’t find home ownership to be drudgery. I find it quite fun, and part of this spring’s maintenance work hereabouts will include paint brushes and bright-colored paint. You seem to have gone native. Nice move! There seems always to be projects around the house. What is nice is that the tradesmen to accomplish them will not send you to the poor house like NOB. Had a plumber do work here last week. He was here for half of the day and the price was what four McDonald’s Big Macs would cost in the U.S.
Tancho: We had the ceramic floor installed in Mexico City for a song and dance, one of the many joys of Mexican life. Four Big Macs? I have no idea what Big Macs cost either here or above the border, but I imagine they cost less than a plumber charges up in Gringolandia. I knew as soon as I wrote that you would say that. They are the same price as down here, in pesos. Last time I bought one in Mazatlán they were about 85 pesos, which was around 4.00 bucks. So about 15 dollars for half a day’s work. Last time we got a plumber in the states about 7 or 8 years ago, it cost $90 bucks just to show up. And that’s without doing anything. No wonder no one can afford much in Gringolandia. Good Lord, Tancho! A Big Mac costs 85 pesos? I get a great comida corrida down the highway for about that amount. Healthier too. Even in CDMX, there’s a vegetarian comida corrida near my place where I can get a 4 course lunch with table service and live music for 65 pesos. Why anyone would pay up for McDonald’s is beyond me. Kim: Live music always guarantees that it’s my first and last trip to any restaurant. If I want a concert, I go to a concert, which I never do, but that’s beside the point. When I’m in a restaurant I want to eat without any flipping concert. Well, I mostly agree, and in this case, it’s only a guy with a synthesizer playing old pop tunes. And I’d rather he weren’t there. But my point was that there were much better deals to be had than McD. 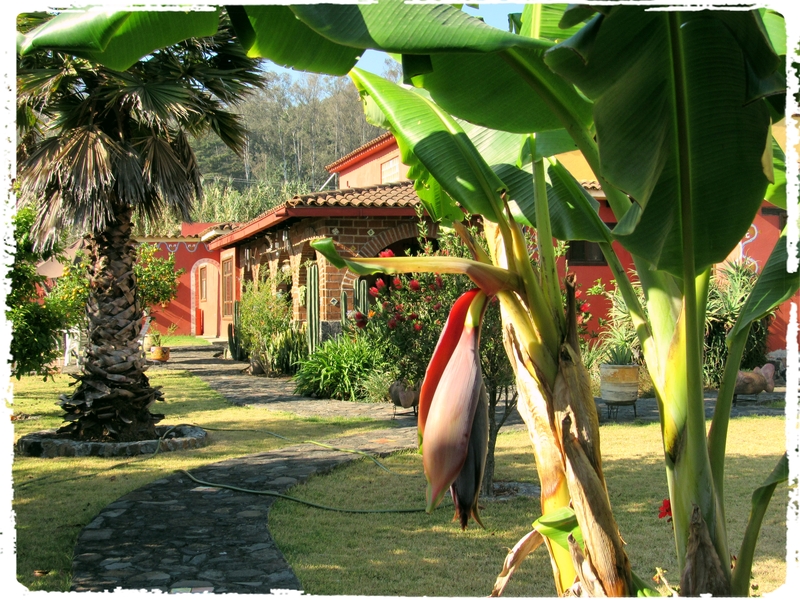 Is that your spread in Pátzcuaro? It’s gorgeous. I’m always amazed how going from San Miguel to Pátzcuaro one goes through a total climate change, much greener and more tropical out your way. Construction there is also warmer in appearance because of the use of wood, as opposed to San Miguel where everything is stone and cement. We’ve tried to steal some of the beautiful scenery of Michoacán and planted three Michoacán pines, those beautiful evergreens with the long, droopy needles. Amazingly enough, they are thriving. The apricots and olives, not so good. Señor Lanier: It is indeed our spread. If you look at the top right of this page, there are links. One says “Photos of Hacienda, other good stuff.” Feel free to take a much better look than that sole photo provides. Yes, it’s different here. Truth be told, I kinda prefer the San Miguel topography, being a desert fan. It’s not full desert there, but it’s much more so than here. But topography is about the only thing I prefer in San Miguel. Well, that and the restaurants. It was 11 years ago that we moved to Michoacán based mostly on its climate and beautiful mountain terrain. We think we are now in a prime location, in a small rural ranching village. Been here 10 years, going on 11. Gracias, señor Cuevas. Just goes to show that in Mexico it pays to be patient. Sometimes, very patient. Congrats on finally (Finally!!!) getting your deed. As you know, I’ve been following this tale of documentary woe for some years now, so I know what you’ve been through, and I’m delighted that you’ve finally triumphed. And it’s got to be a really wonderful thing knowing that you now have a new floor in a service patio that you’ll use maybe twice a year, haha. Where we’d like to find some cheap labor right about now. Lots needs to be done. Kim: Yep, finally got the deed. It still sits in its big envelope on the table next to my desk here. And we’ve decided to hold onto the place too. Not gonna sell in the foreseeable future. It’s a nice investment. Kim: Providing cheap labor is what undocumented immigrants excel at, particularly in California! Señor Lanier: I call ’em illegal aliens. The term is correct, plus it gives the apologists the vapors. Lic. Zapata: Aliens sounds like extraterrestrials and Mexicans haven’t been to the moon (yet). Ha. Señor Lanier: Yeah, it does sound like that, but it’s worth using just to give the lefties the vapors. That’s always fun. So just throw open the borders, then? Or do you genuinely think the current “obstacle course” method whereby we only admit those who can pass is best? Kim: going back to my college days, I think your comment about ‘opening up the borders’ is called “reductio ad absurdum” and it falls under fallacious reasoning or argumentation. What I was suggesting is that some Americans knock illegal immigrants except when they need some nasty work done and don’t want to pay full wages. Maybe you can start a new trend in California, or Boston, by hiring native güeritos and paying the $13 or $15 an hour they would demand to pull your weeds under the blazing sun. Señor Lanier: I knew what you were getting at. I suspect that I’ll end up doing it myself. That’s what happens in Boston, anyway.